Product prices and availability are accurate as of 2019-04-20 14:36:32 UTC and are subject to change. Any price and availability information displayed on http://www.amazon.com/ at the time of purchase will apply to the purchase of this product. 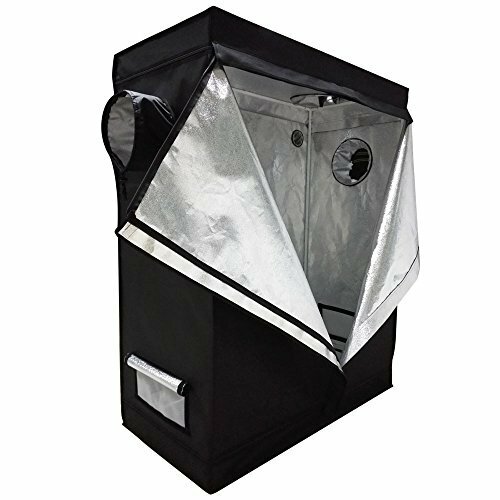 The durable and reliable grow tent is made of heavy duty 210d lightproof oxford cloth and highly reflective waterproof Mylar together with the strong Zipper,it will provide a best environment for your plant! Ships from USA! Don't hesitated to buy! High-grade materials and fine workmanship, durable and reliable to use,6 sizes for choose. Exterior material: heavy duty 210d lightproof oxford cloth. Interior material: 100% highly reflective waterproof mylar. Two zippered windows for sun shining or ventilating more convenient. Two-double vents for regulating the flow of air more effective.